Davids Medienkritik: Bush's Down ... Oops, He's Up! / Bush sinkt ... Hoppla, er steigt! Bush's Down ... Oops, He's Up! / Bush sinkt ... Hoppla, er steigt! Bush's image has reached a new low point. The discussion about the torture of Iraqi prisoners has lowered the standing of the US President. Never before since the begin of his presidency has Bush's popularity sunk so low. More than half of all Americans are dissatisfied with the head of state. The article virtually basks with joy in the negative results for Bush. Bush's favor with the voters in the representitive poll is still one percentage point ahead of his Democratic challenger John Kerry for the presidential election in November. "With nearly six months remaining before the November election, Bush led Kerry 48 percent to 47 percent in the survey -- a reversal of a poll taken last week, which found the Massachusetts senator with a 1-point edge, 49-48." Update: SPIEGEL ONLINE has a tradition of mispresenting Bush poll figures. Bush sinkt ... Hoppla, er steigt! Die Diskussion um die Folterungen irakischer Gefangener hat den US-Präsidenten einiges Ansehen gekostet. Noch nie war die Popularität von Bush seit Beginn seiner Amtszeit so tief gesunken. Mehr als die Hälfte der Amerikaner (ist) unzufrieden mit dem Staatschef. Der Artikel badet geradezu in den negativen Ergebnissen für Bush. "In der Wählergunst liegt Bush der Repräsentativbefragung zufolge derzeit aber immerhin noch einen Prozentpunkt vor seinem demokratischen Herausforderer John Kerry bei den Präsidentenwahl im November." "Noch" einen Prozentpunkt? Bush hat gegenüber Kerry sogar zugelegt! With nearly six months remaining before the November election, Bush led Kerry 48 percent to 47 percent in the survey -- a reversal of a poll taken last week, which found the Massachusetts senator with a 1-point edge, 49-48. Nachtrag: SPIEGEL ONLINE hat eine Tradition der Trickserei bei der Präsentation von Bushs Umfrage-Daten. The Berliner Morgenpost had today an IMO nice (German-language) article here on rallying for votes amongst the 10.000 resident Americans living in Berlin. And the Democrats will likely have Kerry's sister Diane coming to Berlin on the 23rd of May. On 4th of July, there will be a music-festival here organized by a group called "Vote 44". AVA appear to be leftist peaceniks - further left than the Democrats - when reading their mission statement. I endorsed the Prater above, not necessarly AVA, though I liked their stand on Iraq. Some times what I find to be very interesting is the Europeans discussion of what is right wing and what is not right wing in America. It would seem that some in Europe take the position that any American who is to the right of Ted Kennedy or the editorial writers of the New York Times is right wing. This discussion is further confused when terms such as conservative, moderate, and Republican are added to the discussion. For this to be confusing is understandable. Unfortunately, while Europeans make their own judgments as to what not only do these terms mean and which political organizations or individuals should be labeled as right wing, they really are not in a position to accurately do this. The primary reason for this is they have such little understanding of who Americans are and what they believe. This is compounded by their limited access to information about America, be it by their own choice or by being fed the viewpoints of their elites. Some Europeans use alternative American news sources about America to try to gain a greater understanding of America and Americans. They tend to limit themselves to what they have been in many cases been told are the most influential sources of public opinion or to ones which are easy to obtain. Many use CNN International as a source, or the New York Times, or the Washington Post or The International Herald Tribune for these sources. Europeans also tend to use the over the air news broadcasts of the major networks (NBC, CBS and ABC) to validate these other sources. While all of this is useful in some ways to gain a better picture of America and Americans, it actually does just the opposite. In more cases than not it only reinforces the views that are being reflected by their own elites. What Europeans fail to realize that in America there are competing ideas and opinions and competing reporting of the news. For an American to understand this is relative easy when compared to the understanding of a European. A good example of these differences occurred last week during the SECDEF appearance before Congress. Having fortunately being in a position that day to watch the hearing from beginning to end, I was able to witness first hand what was said. How this was reported was entirely different. The more balanced reporting was on FOX. The most unbalanced reporting was on CNN. It was interesting to see how each news network selected what it would show and then the reports it used to follow on with this story. Some might ask how is this possible if Americans are exposed to the same news and ideas and opinions that Europeans are, how can they have such different viewpoints on so many different subjects. Europeans fail to realize that Americans are much more independent than they are. They tend more to form their own ideas and opinions about things. This is as much a culture difference as it is an environmental difference. For example, FOX cable news has more viewers than the other cable news channels combined, this includes CNN and CNBC. Just two radio talk programs, Rush Limaugh and Sean Hannity, have more than 20 million listeners per day. which exceeds the combined audience of all other national broadcast news and news entertainment shows. These are just two of the many of hundreds of the voices heard on the radio. Equally while there is a NYT there is also a Roanoke Times whose readership exceeds that of the NYT. The editorial positions of these two newspapers are quite different. The Roanoke Times is surely not right wing but it is equally not as liberal as the NYT either. The effect of these varying and competing sources of information, that America is so fortunate to have, means how Americans form their opinions on issues are much different and much more complex than it would appear from limiting ones sources of news. This I think is why so many Europeans are surprised when Americans take a different point of view than they do. Can you still get air up there, speaking from such an incredibly high soap-box? Medical safety first, you know! "Can you still get air up there, speaking from such an incredibly high soap-box? Medical safety first, you know!" Chill out, Klink, the war's over you know. Joe is absolutely right about the much greater diversity of information sources in the US. Some of you ridicule my claim that listening to Rush Limbaugh and others like him is one way to be "intelligently informed." Obviously I don't mean that Limbaugh is infallible, and the font of all wisdom. What I do mean is that he is a spokesman for a world view that is not reflected in the mainstream media, and often brings out facts that that media occasionally "forgets" because they don't agree with the prevailing "spin." No one is well informed who has no clue what the other side is thinking. The lack of an alternative source of information promotes precisely that kind of self-righteous complacently so characteristic of the German left today. Klink tells us that Limbaugh is unnecessary, because there are more "civilized" alternatives, as Victor Davis Hanson, Charles Krauthammer, etc. I like Hanson and Krauthammer, too, but the fact is that their audience is tiny compared to Limbaugh's. People like them have been writing columns in American magazines and newspapers for decades, with little real effect on the mainstream media. They have always simply lacked the influence to have any real impact. Talk radio, and, more recently, the proliferation of influential bloggers, have been far more effective antidotes to the arrogance of the mainstream media. When the mainstream types try to "spin" or slant the news, talk radio and the bloggers are in their face in real time, reaching tens of millions of listeners and readers. They have a real impact that a few newspaper columns appearing a week after the fact could never hope to equal. In a word, a few Limbaughs would do Germany a world of good, and I hope for the sake of her future that she gets them. Now, finding myself a little dizzy, I surrender the soapbox back to Joe, Klink, et. al. Tja, Klink - Nach 1 1/2 Jahren im Deutschen Auswärtigen Amt in Amerika wo ich auch täglich die Möglichkeit hatte, von einer Vielfalt von sowohl Amerikanischen als auch Deutschen Presse-Quellen zu erfahren, muss ich meinem Landsmann Joe zustimmen insofern als ich auch ständig das Gefühl bekam, dass die Meinungsvielfalt den Deutschen Medienquellen fehlte. Ich sage das auch nicht irgendwie um dich zu ärgern, denn ich würde sowas hier in Berlin echt begrüßen. Übrigens war ich bei unserem Kumpel Daniel bei dem Grünen Länderrat letztes Wochenende. Nachdem ich ihn anhörte, war es mir dann zum ersten Mal persönlich ganz klar wir ernst und wahr das ist, dass die Grüne Europapolitik aus wirklich nichts ausser ausgeübten Amerikafeindlichkeit besteht. Könnte es denn sein, dass das deiner Meinung nach einfach allgemein Hegemoniefeindlichkeit ist? Der Typ hat unter anderem tatsächlich die Bush Regierung mit Maoisten und Bolschevisten verglichen, und dann von "Amerikanischen Gulagen" gesprochen. Irgendwann wird das auch mal doof. Ich weiss, eigentlich ist das ja ein anderes Thema. Nach dem "Fury in the Slaughterhouse" Konzert gestern Abend wo das Publikum sich herzhaftig über den dicken Amis lustig machte bin ich immer noch ein bisschen empfindlich. Da meinen also deutsche Parteien, es sei genug Programm. gegen die USA zu sein. Aber vielleicht haben sie sogar Recht?! 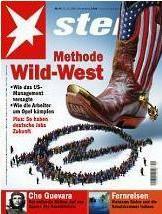 Vielen Deutschen hat das ja im September 2002 gereicht. ja, Klink - Nach 1 1/2 Jahren im Deutschen Auswärtigen Amt in Amerika wo ich auch täglich die Möglichkeit hatte, von einer Vielfalt von sowohl Amerikanischen als auch Deutschen Presse-Quellen zu erfahren, muss ich meinem Landsmann Joe zustimmen insofern als ich auch ständig das Gefühl bekam, dass die Meinungsvielfalt den Deutschen Medienquellen fehlte. Ich sage das auch nicht irgendwie um dich zu ärgern, denn ich würde sowas hier in Berlin echt begrüßen. Man kann diesen Mangel an Vielfalt im rechts-konservativen Lager im Vergleich zu den USA durchaus bedauern, aber den bestehenden Medien nicht zum Vorwurf machen, wie ich bei Joe und anderen manchmal den Eindruck habe - soll halt jemand mal Geld auf den Tisch legen, wenn für sowas Bedarf besteht und sowas aufziehen, wir haben doch Pressefreiheit. Die einst links-radikale taz am anderen Spektrum wurde ja auch mal als gezieltes Gegengewicht gegründet. Und zweitens denke ich: Sowas wird bei uns immer scheitern, weil Deutschlands Eigenverhältnis quer durch die Bank zu verkrampft und verkorkst ist - und angesichts der Historie ja auch durchaus verständlich und teilweise berechtigt. Sieht man auch schon hier in diesem eher konservativen Blog: Man liest Deutsche, die offen ihre Unterstützung für US-troops oder die israelische Armee aussprechen, aber nur wenige Stimmen positiv und unterstützend über die Bundeswehr. Sowas wäre doch undenkbar bei echten Rush-Limbaugh-Amerikanern und finde ich hier deshalb immer eher belustigend, wenn man dann noch Limbaugh als Vorbild für Deutschland zitiert. Oder so wie auch die deutsche Linke jeder Coleur (auch diese neuen "pro-Bush" Linken!) offenbar das "anti-Deutsche" eint. Was in den USA auch z.b. problemlos für fast alle geht, nicht nur für die rechten Talkradios, ist auch "I am proud to be an American" oder auch schon mal "Americans first" bei bestimmten Themen (wie Kaufboykotts) zu sagen. Du kannst das einfach nicht umsetzen oder auch nur umsetzen wollen. Oder nenn einfach mal politische Namen in Deutschland, die Dir gefallen. You said that all so much better than I was able too. One of the reasons I think a Hannity or a Limaugh would fail in Germany is their views would be too much of a challenge to the current form of government and the attitudes that has created in the citizens as a group. I want share with you a topic, which I have been following for some time now. It is the economy situation in Germany. I am following this because I see potential lessons to be learned from it for America. One of the more interesting aspects of this is the fall out of the relative minor changes to the social welfare state that the SPD has so far passed. There seems to be a disconnect between so many segments of German society on this issue. Some think these changes are only a start, others they are enough and others who feel they have gone too far. Some of the reasons stated for these changes were to reduce the costs of both labor and the welfare state. Then almost before the ink is dried on these changes a new law is in the process of being passed about training programs. This will require companies to hire people to train them for jobs. It seems it does not matter if there will be jobs for them to fill or not or whether the companies can afford to do this. So while on one hand an effort is being made to reduce labor costs on the other hand actions are being taken to increase labor costs. One of the possible fallouts from these changes is formation of new political parties. So one has to assume if these measures were considered to be too drastic for some SPD party members then they would be rolled back. These new parties seem to want to give the citizens more. To be able to do this it would seem that state income in the form of more taxes would be required. The only entries, which pay taxes, are corporations and individuals. I can only begin to think what this would mean. It would seem to give those who are paying the taxes even more reason to leave and those who are receiving the taxes to want even more. For someone to point this out to the German people surely would not be something they would want to hear. So, maybe Bush was RIGHT about Saddam and al Qaeda, after all. I'm very eagerly looking forward to the apologies of the peace movement, Konstantin Wecker etc. to the Bush administration. Being a bit broader minded than you are or at least more so than you have been able to demonstrate to this point I find your comment to be a validation of my own. As I am sure you not only watched the hearing before congress from beginning to end as well as watching the reporting of these hearings on CNN, FOX, the major news entertainment shows as well to read how they were reported by the WT, WP, NYT, NYP, the WSJ, and on talk radio, and various local radio and newspapers in America, your assessment is that FOX DID NOT present this in the most balanced an accurate way. Or do you mean there is a wide range of competing viewpoints and ideas expressed by the media in Germany. As for being a FOX endorser, I am not sure what you mean. If you mean does FOX presents a more accurate point of view of news events, then I probably am a FOX endorser. My own experience, while anodal, bears this out. But to limit oneself to a single point of view tends limit ones ability to make prudent assessments about the events taking place about them. Anything is possible. If Germans can make a cult following watching "Married with Children," then talk radio can succeed in Germany. Germany is full of Al Bundys: sad men who remember the Wirtschaftwunder, the D-Mark and the pre 1990 Mercedes "S" class. 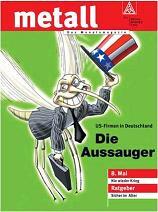 They wonder how Germany ever went from being the thrird largest economy in the world to Europe's basket case economy. Germany's leaders have failed her. They do not offer any solutions, just hot air. Instead of tackeling Germany's serious problems, they attack Germany's reliable friends and allies. The unification with the east is like marying Peg Bundy. Like Peg, the East spends money like it is made out of Weissbier. The work ethic of the east is like Peg's cooking: unbearable. The Bundy children are now the core membership of the Greens. The time is right for change and talk radio. Hier ist so eine Stimme: unterstütze das Vorgehen der Amerikaner und Israelis, bin auch dafür, die Bundeswehr deutlich, auch finanziell, aufzuwerten. Andererseits glaube ich, dass viele hier, die von unserer Bundeswehr wenig halten, es deswenig tun, weil sie sagen: Entweder eine richtige Armee, oder gar keine. Immerhin konsequent re: eigener Haltung. Und re: Andererseits: Irgendwann muss man mal anfangen mit dem _eigenen_ moralischen Aufwerten, wenn man dies so sieht. Denn wer immer nur runter schaut auf die Armee seines eigenen Landes, darf sich dann vielleicht nicht wundern, wenn so Dinge passieren wie in Kosovo und auch Dinge wie Finanzierung sind letztlich ein Spiegel gegenüber dem Wert der Armee innerhalb der Gesellschaft. Die Finanzierung ist eben deshalb so lausig, weil es noch nicht mal hier, in einem eher konservativen Blog, richtige Unterstützung für die Bundeswehr gibt. Ich bin überrascht. Dann sind wir ja mal wieder einer Meinung, offensichtlich sogar in der gleichen politischen Strömung beheimatet. Wie kommts? Hat dieses Blog dich tatsächlich schon, wie von Ray D. bemerkt, so sehr zum positiven verändert? _Ich_ sprach von schlankem Staat und Bürgerrechten. I bet you were just like Klink and you didn't get a pony when you were a little boy for Christmas either. To all those Who have contributed to this blog I wish to extend my thanks to all those who have contributed. As chairman of the Republicans Abroad in Germany I applaud all those who by the courage of their convictions express their thoughts and contribute the dialogue of democracy. May we all also have the courage to defend and pass the gift of democracy on to those do not enjoy the same blessings of liberty in life that we enjoy here. Keep up the conversation, but remember that actions still speak louder than words. Kudos to you all, Henry Nickel. To all those Who have contributed to this blog I wish to extend my thanks to all those who have contributed. As chairman of the Republicans Abroad in Germany I applaud all those who by the courage of their convictions express their thoughts and contribute to the dialogue of democracy. May we all also have the courage to defend and pass the gift of democracy on to those who do not enjoy the same blessings of liberty in life that we enjoy here. Keep up the conversation, but remember that actions still speak louder than words. Kudos to you all, Henry Nickel. Btw, the talk radio idea isn't a bad one.